Without a formal league until just a few months before the climactic battle of Yorktown in October 1781, the fledgling independent republics of the Revolutionary War somehow managed to frustrate the most powerful nation on earth. On March 1st, Maryland, under threat of invasion by General Cornwallis, joined twelve other states in confederation. As Maryland illustrated, the first purpose of the confederation was common defense from the English Army and Royal Navy. 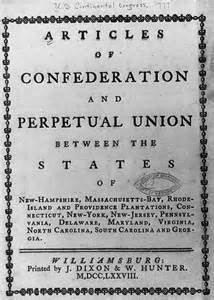 The Articles of Confederation (AC) formalized the powers of a pre-existing congress of the states. With one vote each, Rhode Island had as much influence as Virginia. Congress decided peace/war and foreign policy; it could build and keep a navy, borrow money, ask the states for men and money, and it performed some other duties of a general interest. Considering our experience with Parliament and George III, this was a very generous allotment of authority. However, its exercise was carefully guarded. To carry any measure required a majority of states, and anything of special importance required nine or all of the states. Along with certain powers granted to congress others were prohibited to the states. They could not enter treaties, confederations or alliances without the consent of congress. The Articles clearly marked the line between powers granted and retained. In comparison with historic leagues among independent republics the AC framed a model confederacy. Two important powers, whose absence and necessity were soon evident, were those over taxation and commerce. Combine these shortcomings with the lack of a chief executive it was soon clear to many that behind the façade of the AC was no government at all. The confederation congress could propose anything yet enforce nothing. Wars cost money. Lots of it, and with the help of France and several issuances of paper money that inflated away, the pre-AC congress managed to keep a leaking ship of state afloat for several years. As European powers balked at further loans, congress sought a source of revenue to pay the rapidly growing interest. In February 1781 it settled on a five-percent import duty, but Rhode Island withheld the required thirteenth vote. Rhode Island reasoned the impost would bear hardest on commercial states, and subject them to federal revenue officers unaccountable to state law. The memories of British enforcement of commercial taxation were still fresh. Before the peace treaty with Great Britain in 1783, congress made another attempt to restore public credit. In April 1783 the states were asked to amend the AC to provide congress for twenty-five years with power to levy another small import duty for the specific purposes of discharging principal and interest on the debt. In 1786 the amendment went down to defeat in a cacophony of mutual suspicion. Commerce was a mess. England restricted American imports, yet freely exported to most states. As early as 1784 congress passed resolutions declaring it advisable to meet England’s insults with similar restrictions; it asked authority from the states to pass a fifteen-year navigation act to regulate foreign commerce on behalf of the US. It wasn’t to be; sectional jealousy between southern agricultural states and northern carrying states was too strong. So strongly did Massachusetts feel the need for some commercial regulation the General Court passed resolutions in July of 1785 in favor of a convention to revise the AC . States were increasingly reluctant to send delegates to an ineffective congress which increased its ineffectiveness. On only three days between October 1785 and April 1786 were nine states present on the floor of congress. Months went by in 1786 without a quorum to conduct any business at all. Leading men recognized the looming danger of disunion. Nothing prevented increasingly desperate states from allying with a foreign power. From our Declaration of Independence as corollary to the security of rights, government must be in forms “most likely to effect (the) safety and happiness” of the people. The Articles of Confederation were a logical and bold first effort for thirteen republics birthed in the midst of war, yet its structure crippled the safety and happiness of the people. Consider the courage and determination of our Founding Generation. In eleven years, from 1776 to 1787, they not only secured independence, they recognized the shortcomings of an inadequate government and took steps to correct the situation! Is America circa 2017 capable of such clear thinking and action? As more states sign on to the Convention of States movement, it appears the answer is a resounding “YES,” we can save the great American experiment in free government. Reference: McLaughlin, A. C. (1905). The Confederation and the Constitution. New York: Harper and Brothers Publishers. Pages: 47-51, 53-55, 79, 82-87.